Few will dispute that the Seventies represented the darkest period for Disney animation. Not that the decades the immediately preceded and followed that one didn’t have lots of their own problems. In the Sixties, the studio produced its smallest roster of releases, with only four fully or partially animated flicks during that period. In addition, Walt died in 1966, which left the company without it co-founder and leader. However, despite the limited number of movies they produced, three of the four - 1961’s 101 Dalmatians, 1964’s Mary Poppins, and 1967’s Jungle Book - made oodles of money and all remain highly regarded by many fans. As for the Eighties, Disney spent much of the decade mired in problems, and the studio barely survived the period. Indeed, they wouldn’t produce a genuine success until 1988, when they collaborated on the partially animated Who Framed Roger Rabbit, which became one of the year’s big hits. 1988’s fully-animated Oliver and Company pretty much stiffed, but at least Rabbit helped revive the ailing animation division. By 1989, they reclaimed their throne with the enormous success of The Little Mermaid, and Disney animation clearly re-entered the world of the living. Unfortunately, the Seventies featured none of the highlights seen in the Sixties or Eighties. Disney suffered from a lack of direction without Walt’s presence. The studio managed to produce six films with animation during the decade, which equals their output in the Eighties and tops what they did in the Sixties. However, that figure comes with an asterisk. One-third of these were live-action offerings that included some animation; both Bedknobs and Broomsticks and Pete’s Dragon. That 33 percent of the total represents an increase over the 25 percent seen in the Sixties and the 16 percent witnessed in the Eighties. In addition, only three of the four fully animated flicks provided all-new material. Bizarrely, of the six films from the decade, half of them came out in 1977! This included the partially animated Dragon and well as The Rescuers and The Many Adventures of Winnie the Pooh. The latter probably shouldn’t really count as part of the Disney feature film pantheon, however, since it offered nothing more than a series of short films cobbled together. It provided no overriding plot and simply seemed like a cheap and easy way to get some product onto screens. What does it say about the state of Disney animation at the time when I note that Adventures offers arguably their most entertaining feature from that decade? The material itself seems winning, and it comes across as a minor gem among the decade’s other clunkers. Adventures combines three shorts, all of which come from different years. First comes 1966’s Winnie the Pooh and the Honey Tree. In this tale, the always-hungry Pooh (voiced by Sterling Holloway) goes on the hunt for some eats. He disguises himself as a rain cloud to steal honey from a tree - there’s your title! - and then gorges himself at Rabbit’s (Junius Matthews) house. Pooh eats too much and can’t get through Rabbit’s door. He gets stuck and must remain there until he loses enough weight to depart. In 1968’s Winnie the Pooh and the Blustery Day, we meet two significant new characters: Piglet (John Fiedler) and Tigger (Paul Winchell). Some inclement weather comes to the Hundred Acre Wood, and eventually this destroys Owl’s (Hal Smith) house. While Eeyore (Ralph Wright) tries to find him a new abode, Pooh encounters a new resident of the Hundred Acre Wood: Tigger. A rainstorm then floods the area, but Pooh accidentally rescues Piglet from a waterfall. All ends well with a “Hero Party” and a surprise when Eeyore announces the results of his search. Obviously Tigger became popular during Blustery, as he attained greater prominence during Winnie the Pooh and Tigger Too!. Curmudgeonly Rabbit tires of Tigger’s hyper exuberance and gets Pooh and Piglet to help rid the Hundred Acre Wood of his presence. They take him to get lost in the woods, but this backfires when they can’t find their way home. Eventually Pooh’s stomach leads the way. In the meantime, Tigger and Roo (Clint Howard) go for a bounce and get stuck in a tree. This terrifies Tigger, and he agrees to Rabbit’s demand to cease bouncing if he’ll get him down from the tree. Tigger keeps his word but becomes very mopey, at which point Rabbit reluctantly accedes to the others’ opinions that a happy - albeit bouncy - Tigger is best. Adventures hearkens back to the second half of the Forties, when Disney created not one single-narrative animated feature. Instead, films like The Adventures of Ichabod and Mr. Toad and Fun and Fancy Free just combined shorter pieces into one feature-length film. However, at least those movies provided segments created explicitly for their releases; Adventures just cobbled together some old shorts. Still, Adventures works because the material seems charming. All three shorts work fairly well, though each successive clip became less and less entertaining. Tree definitely presents the most amusing and likable experience. It offers a sweet and compelling piece that nicely introduces the characters to movie audiences. Blustery also comes across well, though it seems just a little less winning. The short has its moments, and it’s hard not to like the new characters - to the shorts, that is - in Tigger and Piglet, but it appears less fresh and clever. Tigger has its own charms, and it seems good as a whole. But it combines weaker animation and less strong character development and appears somewhat blander. Probably my least favorite moment in any of the shorts: the “Heffalumps and Woozles” bit in Blustery blatantly steals from Dumbo’s “Pink Elephants on Parade”. Frankly, I never much cared for that number either; it seemed self-indulgent and it detracted from that film’s narrative. This second-rate rip-off of the original doesn’t do anything to endear itself to me. One problem with the “bits and pieces” cobbling of Adventures stems from the voice casting. Some different boys play Christopher Robin, and he varies between American and British accents. This gets a little confusing at times, though Robin is such a minor part that it doesn’t matter much. 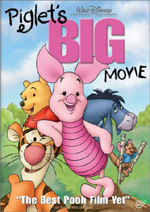 Overall, I don’t think The Many Adventures of Winnie the Pooh is one of Disney’s better efforts. It bunches together different pieces to create a somewhat disjointed affair. However, the various components appear generally entertaining. They might work better on their own than as one long program, but I still think they provide a reasonably fun experience. 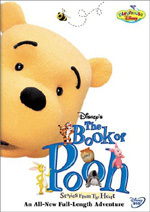 The Many Adventures of Winnie the Pooh appears in an aspect ratio of 1.33:1 on this single-sided, double-layered DVD; due to those dimensions, the image has not been enhanced for 16X9 televisions. Though not flawless, the film displayed a generally stellar picture that rarely betrayed its age. Sharpness seemed excellent. The movie always came across as nicely crisp and well defined. I detected virtually no signs of softness or fuzziness during this distinct and detailed presentation. Jagged edges and moiré effects caused no concerns, and I also noticed no signs of edge enhancement. As for print flaws, they seemed almost totally absent from the film. The image appeared slightly flickery at times, but otherwise, I discerned virtually no defects. The picture looked wonderfully clean and fresh other than a little light grain during the end sequences. 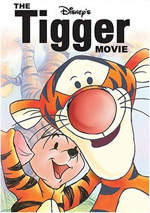 Some parts of “Tigger Too” looked a little iffier, but that resulted from weaker artwork; that segment displayed less positive clean-up work, so it took on a slightly dirtier appearance. Colors consistently came across as rich and vibrant. The cartoons displayed nicely vibrant and accurate tones, and they displayed no signs of bleeding, noise or other concerns. Black levels were deep and dense, while shadow detail looked clean and appropriately opaque. Some of the live-action segments appeared slightly flat, but the vast majority of the flick seemed solid. Overall, Adventures exhibited a top-notch image. While the film’s Dolby Digital 5.1 soundtrack didn’t match up to the picture, it still worked fine for its age. For the most part, it presented “broad mono”, as the audio remained pretty heavily anchored in the center channel. However, the track did start to expand as the cartoons became more modern; “Honey” showed the weakest soundfield, while “Tigger” broadened things to a decent degree. Music demonstrated adequate stereo spread throughout the shorts, while effects offered reasonable but unexceptional presence. Again, the later programs worked best, as they demonstrated some acceptable movement and spread. The surrounds remained quite passive throughout the program, as they never did more than provide general reinforcement of the front spectrum. Audio quality appeared fine for its age. Speech seemed acceptably distinct and natural. The lines were somewhat flat and stiff, but they showed no signs of edginess and they always remained intelligible. Music presented limited range but appeared reasonably bright and vivid. Effects also were somewhat thin, but they lacked distortion, and they also added some modest low-end response at times; for example, the crash of Owl’s house demonstrated fair bass. In the end, Adventures offered a decent soundtrack that was adequate for the material. How did the picture and audio of this 2007 “Friendship Edition” compare to those of the 2002 25th Anniversary DVD? I thought the pair seemed virtually identical in both categories. If anything differentiated the visuals and sound, I didn’t notice it. 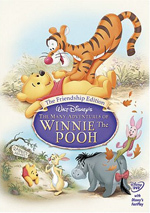 This “Friendship Edition” of The Many Adventures of Winnie the Pooh provides a good mix of extras, almost all of which also appear on the 2002 DVD. The only new component here comes from a “bonus episode” of Disney’s My Friends Tigger and Pooh. The 24-minute and four-second program gives us a semi-educational piece meant for very young ones. It’s probably fun for them but not for anyone over the age of six. As we look at materials also on the old disc, we go to The Story Behind the Masterpiece, a 25-minute and three-second documentary about the film. It provides clips from the film, some behind the scenes photos and art, and fairly contemporary interviews with Director of the Walt Disney Archives Dave Smith, storyman X. Atencio, animators Ollie Johnston, Burny Mattinson and Frank Thomas, songwriters Richard and Robert Sherman, and voice actors Paul Winchell and John Walmsley. While not a tremendously deep documentary, “Story” offers a lot of good facts about the series’ origins, Walt’s plans for it, and a variety of aspects of the production. From the songs to the animation to the casting, we learn quite a lot of good notes about the films. Overall, “Story” gives us a fun and informative look at Pooh. Although Adventures fails to include an audio commentary, we do get Pooh’s Pop-Up Fun Facts. This subtitle track sporadically offers various tidbits. We learn some information about the production, the original A.A. Milne stories, facts about real-life animals, and a mix of other issues. The notes appear too infrequently to be of much value - lots of time passes between many of them - but some of the details seem interesting. Next we see Winnie the Pooh and a Day For Eeyore, a 25-minute and 20-second animated short from 1983. This short covers Eeyore’s birthday, which finds him especially depressed because no one remembers it. (Actually, I don’t think any of the other critters ever knew when Eeyore’s birthday occurred, but he’s even mopier than usual nonetheless.) Pooh and the gang try to make the day special for Eeyore, and they succeed in that realm. Unfortunately, this results in a very bland cartoon that doesn’t succeed well. The filmmakers execute the story in a flat and lifeless manner, and the animation appears surprisingly weak. Colors suffer in particular; at times, Pooh’s body parts change hue simultaneously, and Rabbit takes on an unpleasant shade of pea green. I appreciate the inclusion of “Eeyore”, but I didn’t much enjoy the short itself. In the Winnie the Pooh Art Gallery, you can choose between two different presentations. The “Video Gallery” shows the stills as one running nine minute and 15 second program. On the other hand, you can also check out the images through a “Still Gallery”, where we find 66 thumbnailed pictures. I appreciated the options and liked this collection of good material. The 100 Acre Wood Challenge presents a simple interactive game. You can play as Pooh, Tigger or Rabbit; the contest differs for each, but we get nothing interesting in regard to various rewards. Oriented toward kids, it’s a simple game, or at least it would be if it were correct. The contest suffers from some mistakes, such as when it states that Pooh doesn’t own a honey pot clock. In a music video-style presentation, Carly Simon performs The Winnie the Pooh Theme Song. This clip combines shots from the movie with images of Simon as she lip-synchs the tune. I can’t stand Simon and I didn’t enjoy her bland version of the number. A “Disney Storytime” piece, Pooh’s Shadow provides the standard “read-along” program. Kids can either read the tale on their own or follow it as a narrator tells it to them. As someone who knows how to read fairly well, this does little for me, but it seems like a nice addition for the very little ones in the audience. Another staple of Disney DVDs, we get a Sing-Along Song for “The Wonderful Thing About Tiggers. It allows you to go Karaoke with the Tig. Since the DVD includes subtitles, I fail to understand the need for a separate piece like this, but I guess it doesn’t hurt. When you start the DVD, you’ll find the usual complement of advertisements. Here we get ads for The Jungle Book, Little Einsteins: Rocket’s Firebird Rescue, Disney Princess: Enchanted Tales and Handy Manny. From the main menu, you’ll discover a Sneak Peeks area that includes all of these promos plus clips for Meet the Robinsons, Disney’s My Friends: Tigger and Pooh, and Disney Movie Rewards. During a weak period for Disney animation, 1977’s The Many Adventures of Winnie the Pooh offered some of the studio’s best work. 30 years later, the program seems inconsistent but generally charming and winning. The DVD provides excellent picture along with positive sound and a reasonably good package of extras. Adventures will never be one of my favorite Disney films, but it possesses enough pleasure to make it worth a look. Should fans who own the 2002 Adventures DVD snag this new one? Nope. Both picture and audio seem to be identical for the pair, and the only new extra comes from a forgettable TV show. If you already have the old disc, stick with it. By the way, it may seem confusing that I gave the “Friendship Edition” the same extras grade that I awarded the 2002 DVD even though the new one includes an additional component. That’s simply because I don’t think the “bonus episode” of the TV show does anything to increase the quality of the set.